The Fallout Shelters latest efforts (helmed by super-producer & MC Dynamics Plus, along with multiple personalities Domino Grey, Drew Spence, and Xodus Phoenix) is the realization of a dream being reached, a path that puzzled many fans of the producers former hip-hop efforts. However, with any adversity, great opportunity can come out of it. 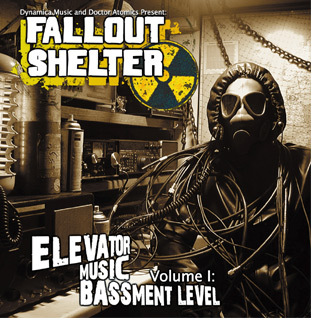 Elevator Music Volume 1: Bassment Level is the “soundtrack to a new film” in the Dynamic Plus universe (not an actual film, but more of a collection of valuable music in his already immense catalog). Overall, the growth he continues to display as a producer is earning him the acclaim of being the name used as a standard for producers of all genres to follow. On top of this all, he’s just scratching the surface. Off of the Lenzmen’s modern-classic LP “Scientific Community & Magnify Lenz”.